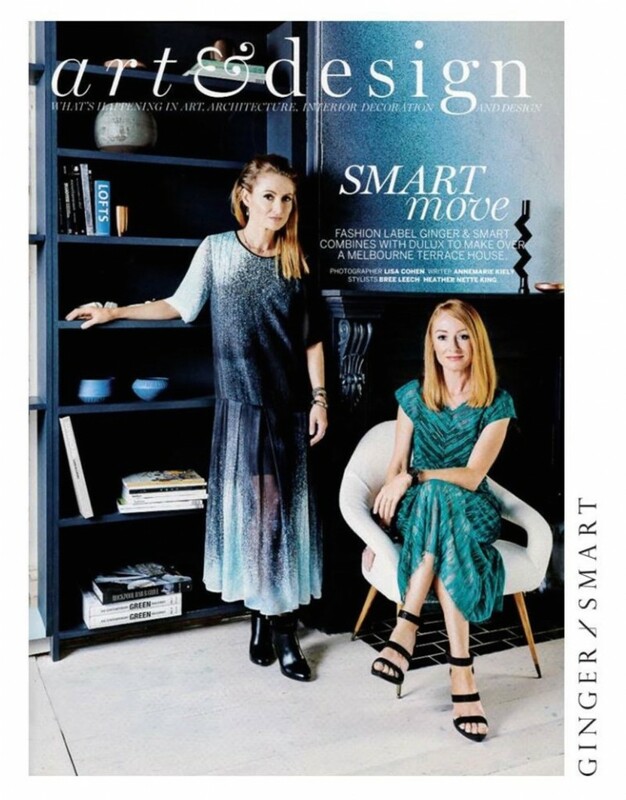 Dulux Australia has partnered with fashion duo, Ginger & Smart, to create a unique series of rooms inspired by the colours, patterns and textures of the pair’s ‘Arcadia’ Winter Collection. 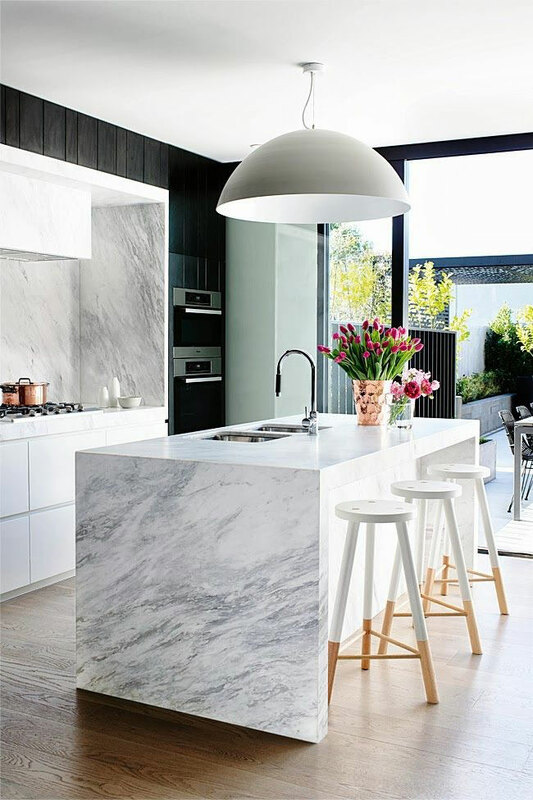 The collaboration is part of Dulux Australia‘s interior design initiative, United by Style, which aims to demonstrate innovative styling techniques that take the latest fashion trends into the home. 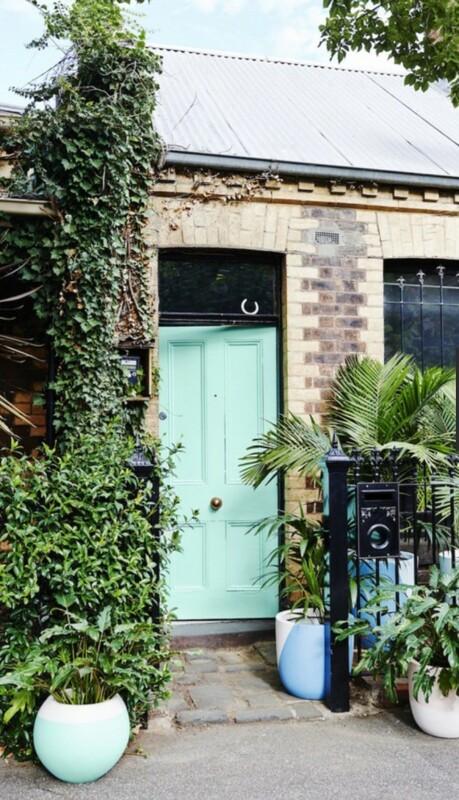 “Fashion and style has a strong influence on the home and we feel this strategic partnership will allow for thought provoking initiatives that blur the boundaries between the industries”, says Rachel Oakley, Marketing Manager, Dulux Australia Colour. “We are proud to be aligning with a premium Australian fashion label that aspires to luxury design and celebrates colour,” Oakley said. Led by creative consultant, Bree Leech, the Dulux interior design team set to work on a tiny 3 room terrace in Melbourne, transforming it into a stunning display of the colours, style and spirit of the ‘Arcadia’ collection, with the help and influence of sisters Alexandra and Genevieve Smart. Heather Nette King assisted with the styling, while Christopher Watterston was responsible for the paint application and specialty finishes in the scheme, including the stunning ombre effect seen behind this mantle. 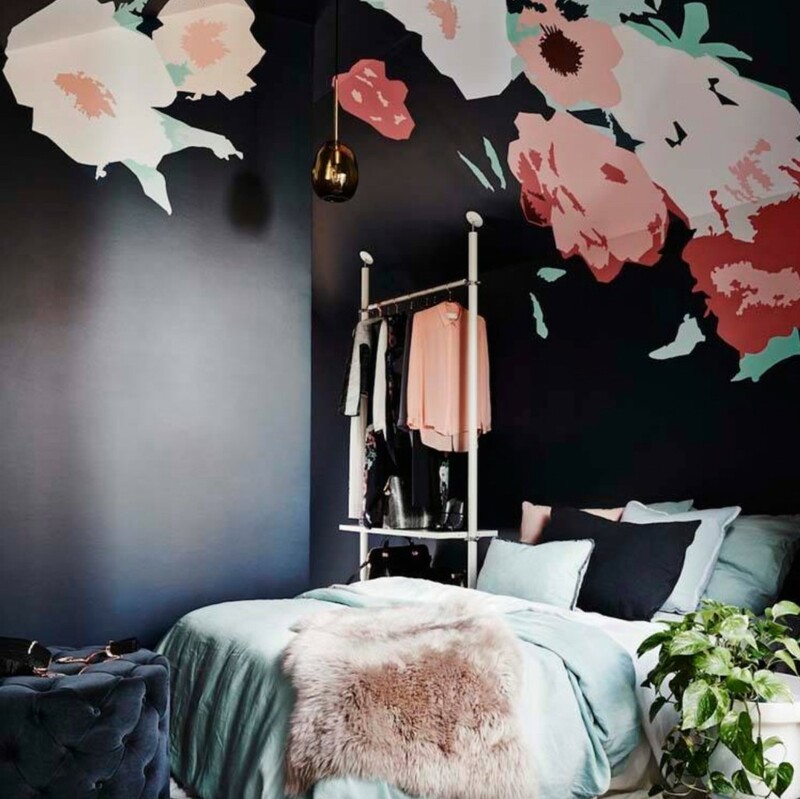 The rooms showcase a predominantly blue, black and teal scheme, offset by timber flooring and white accent pieces with rose gold and copper accessories. 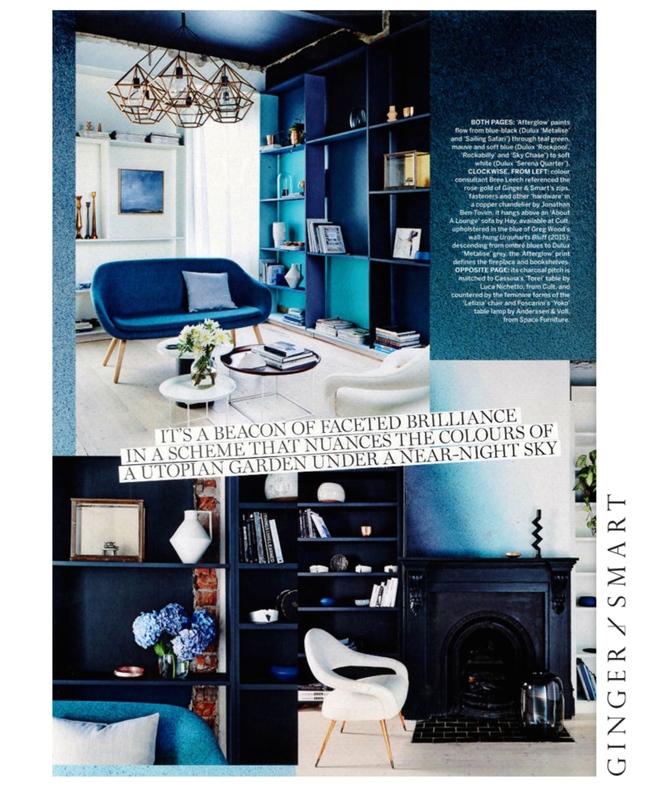 The ‘Afterglow’ paint selections for the walls range from blue-black tones in Dulux ‘Metalise’ and ‘Sailing Safari’ through to teal green, mauve and soft blue in Dulux ‘Rockpool’, ‘Rockabilly’ and ‘Sky Chase’. The white paint used is Dulux ‘Serene Quarter’. This collaboration continues the impressive work of the United in Style team, which has previously worked with fashion designers Romance Has Born and Lisa Gorman, to illustrate the ever-increasing intersection of the worlds of colour, design, fashion and interiors. 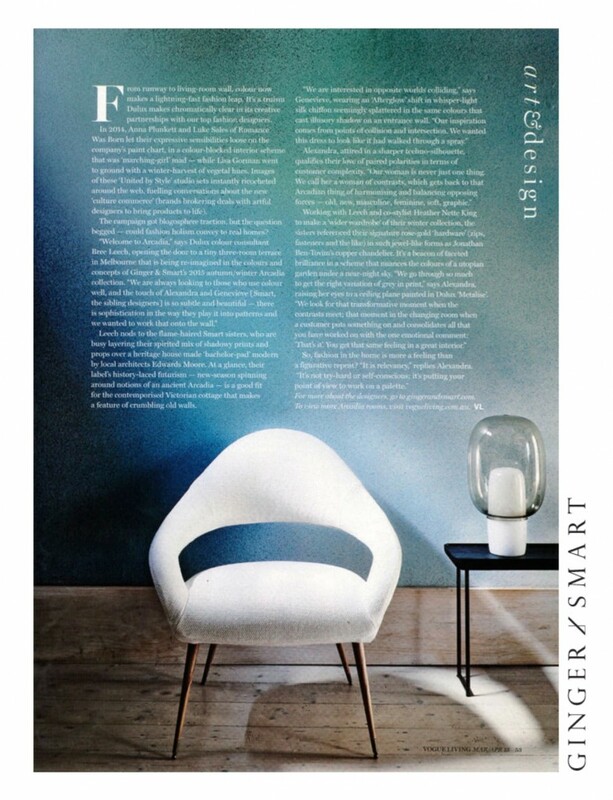 See the full write up in the March 2015 issue of Vogue Living. Hi love the words Jane Ledger and images from Lisa Cohen.